Where to find the best furnished apartments in Bahrain? Even though it is considered a small country, but the kingdom of Bahrain managed to be amongst the fastest developing countries thanks to its ever-growing real estate sector. And with investors flocking from all over the world to invest in this prosperous market, now is the perfect timing to invest in a piece of land in Bahrain. Currently, new real estate projects are coming to light every day where savvy real estate investors are buying off-plan land plots to start their mega projects. Whether in freehold areas or not, lands in Bahrain are a great investment opportunity. But before even considering purchasing land in Bahrain, one should know all about land classifications in Bahrain. Here is your full guide of some of the land classifications in Bahrain prepared for reconstruction and development. 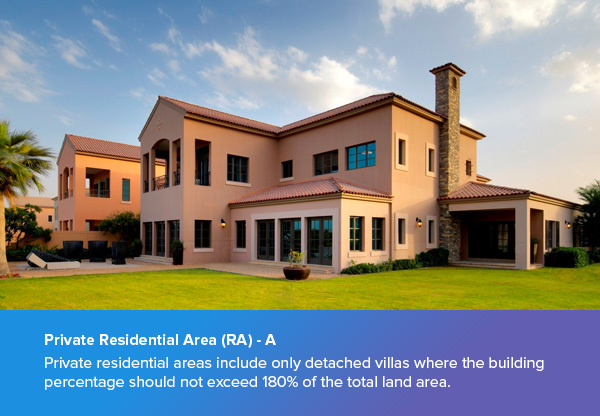 Private residential areas include only detached villas where the building percentage should not exceed 180% of the total land area. And in case of multi-storied property, the build-up of any floor should not exceed 60% of the total land area. Additional residence utilities are permitted with a maximum area of 100 square meters and a maximum height of 4 meters where they won’t exceed 15% of the total land area and are only allowed to be built on the line of the side wall on one side only. And the same goes for an external seating area that shall not exceed 10% of the total land area. As for the car parking lots, a space that fits two cars only will be permitted where this space won’t be calculated as a part of permitted building percentage and this also goes for the basement area as well. In case of connected villas, detached or both, they are only allowed to be built on one side where the share of each villa shall not be less than 200 square meters of the total land area. And for additional building above car parks or residence’s utilities, they shall not exceed 50 square meters with a height of one storey only that shall not exceed 4 meters. 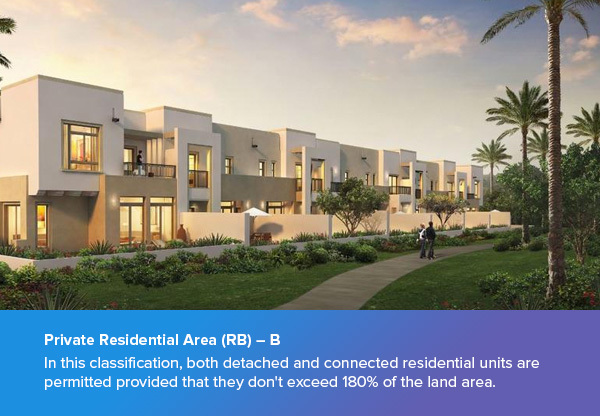 In this classification, both detached and connected residential units are permitted provided that they don’t exceed 180% of the land area. Any built-up area of any floor will not exceed 60% of the land area. 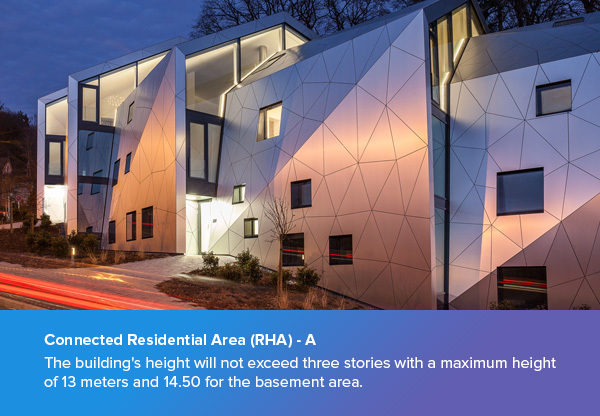 Like the previous classification, any additional building won’t exceed 20% of the land area and are only restricted to external seating areas (with a total length of 40% of land’s front length) and residence’s utilities only. In this classification, the building height shall not exceed 3 stories with a maximum height of 15 meters and 16.50 meters for the basement area. And for those looking to add extra buildings above the garage or residence’s utility should know that any additional building won’t exceed 50 square meters and one floor only with a height of 4 meters. Another requirement for this type of land is that in case the land area is less than 300 square meters or the front façade length is between 12 to 15 meters then, in this case, the building shall be permitted on the neighbour’s side boundary on one side only. 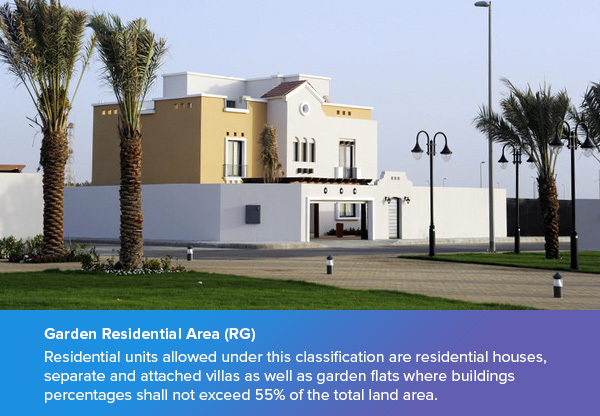 Residential houses, villas and flat are permitted in this land classification where the building percentage shall not exceed 210% of the total land area and the build-up of any additional floor shall not exceed 70% of the land area and that includes the residence’s utilities as well. Each residential unit will be allowed one parking space. The building’s height will not exceed three stories with a maximum height of 13 meters and 14.50 for the basement area. 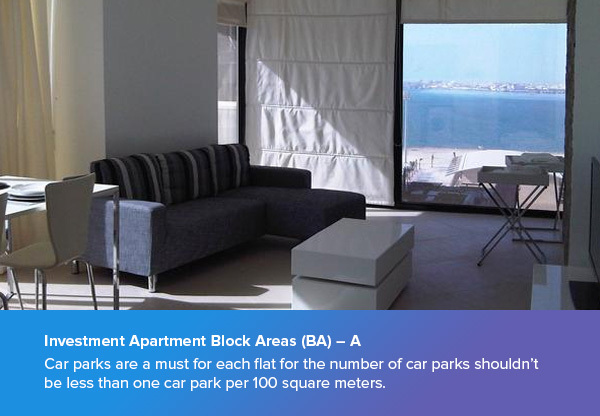 Residential flats area shall not exceed 80 square meters with one car park for each flat. Any plot that overlooks an approved commercial or service road shall be at a distance of no less than 5 meters from the front border of the land overlooking the commercial or service road where this area will be used as footpaths and open parking space. This is another land classification in Bahrain that also allows residential houses, villas and flat where the building percentage shall not exceed 300% of the total land area including veranda, services, staircases and lift shafts. 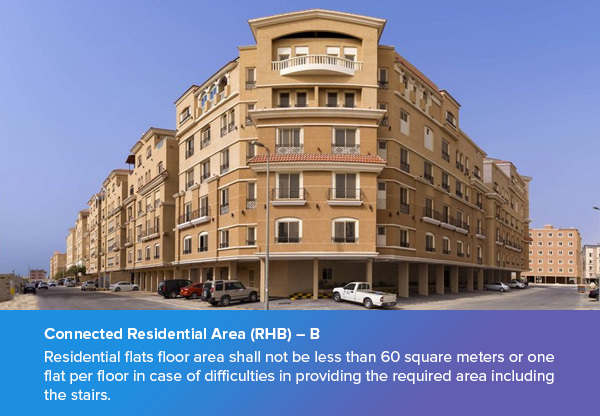 Residential flats floor area shall not be less than 60 square meters or one flat per floor in case of difficulties in providing the required area including the stairs. In case of having a car parking space on the ground floor, then a compensation must be done by adding a fourth floor. 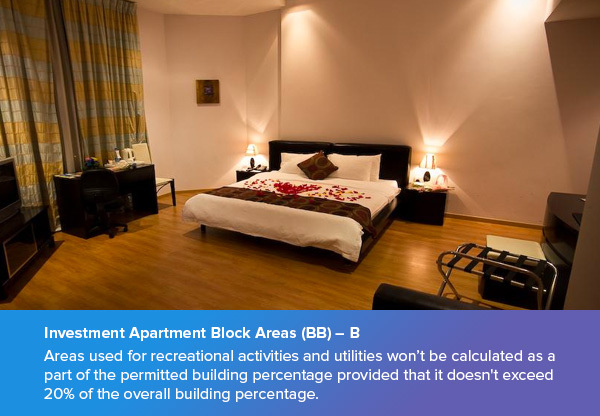 Residential units allowed under this classification are residential houses, separate and attached villas as well as garden flats where buildings percentages shall not exceed 55% of the total land area. More than one residential unit can be built on the same land provided that each unit shall have an area of no less than 500 square meters of the total land area. 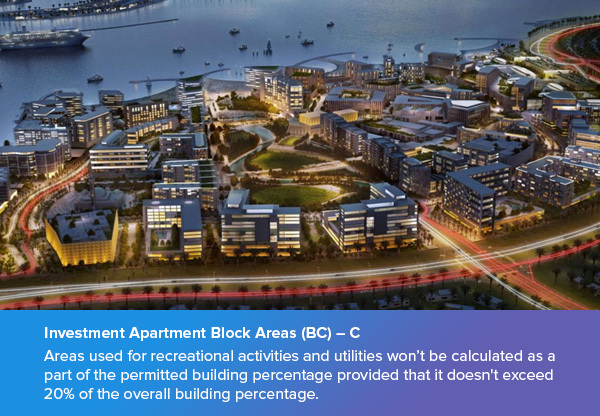 External seating areas and recreational facilities are allowed with percentages that don’t exceed 10% of the land area where this used land won’t be calculated as a part of the permitted building percentages. The buildings will only be two stories with a maximum height of 10 meters and in case of having a basement then the allowed height is 11.50 meters. When building more than one unit on the same plot, the distance between units shall not be less than 4 meters. Whether residential, commercial or management areas; this classification uses is only allowed in these areas where the building percentage should not exceed 1200% of the total land area, however, plots situated in the Diplomatic Area shall not exceed 700% of the total land area. The build-up floor area shouldn’t exceed 60% of the total land area. Car parks are a must for each flat for the number of car parks shouldn’t be less than one car park per 100 square meters. It is worth mentioning that any area used for recreational activities and utilities won’t be calculated as a part of the permitted building percentage provided that it doesn’t exceed 20% of the overall building percentage. In case of mixed-use buildings; elevators, entrances and staircases of residential units will be separated from those of the non-residential units. This plot area is permitted for residential, commercial and management uses only provided that the building percentage doesn’t exceed 750% of the total land area and the build-up floor area doesn’t exceed 60%. Areas used for recreational activities and utilities won’t be calculated as a part of the permitted building percentage provided that it doesn’t exceed 20% of the overall building percentage. In such areas, all agricultural and recreational activities, as well as greenhouses and plant nurseries, are allowed. 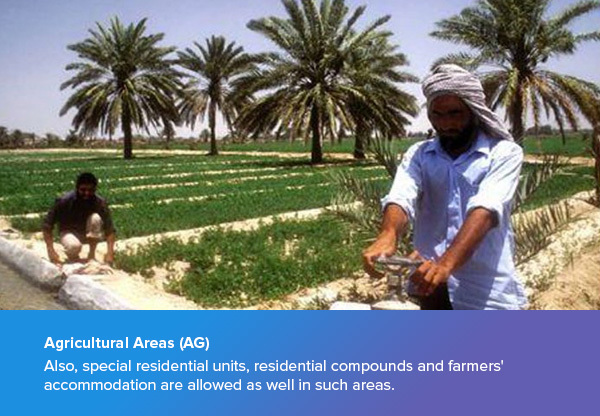 Also, special residential units, residential compounds and farmers’ accommodation are allowed as well in such areas. The total build-up percentage for residential units shall not exceed 30% of the total land area, whereas farmers’ accommodation shouldn’t exceed 5%, while animal pens and stables should not exceed 10%. As for the height, residential unit’s heights shouldn’t exceed 2 stories, whereas the height of farmers’ accommodation, pump rooms, stores, offices and watchmen’s room shouldn’t exceed 4 meters. This area allows light industrial uses, maintenance repair and oil change service workshops in addition to tire repairs and other similar services as well as management offices, industrial and service showrooms and workers accommodation. It is worth mentioning that buildings heights shouldn’t exceed 3 stories with a maximum height of 18 meters. All residential areas, as well as commercial and management areas, are permitted in this land classification where building percentages shall not exceed 500% of the total land area with a built-up floor area of no more than 60% of the total land area.